Last November in Naples, ministers in charge of European space policy gave their blessing for a new Ariane 6 launcher designed to help Europe stay ahead in the satellite launch services market. 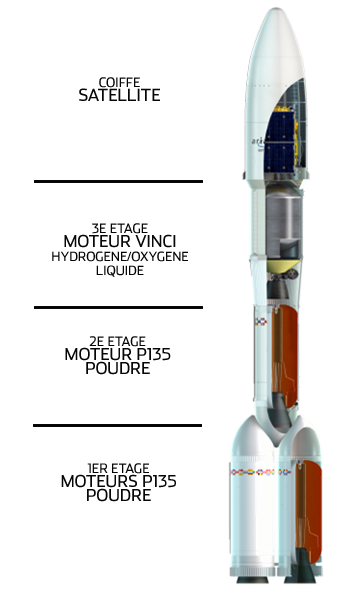 Envisioned configuration of the future Ariane 6. Credits: ESA/CNES/Arianespace. The European Space Agency (ESA), backed by CNES, therefore decided to respond to this challenge with a launcher tailored to future market requirements. In other words, a launcher capable of orbiting commercial satellites weighing up to 6.5 t or smaller institutional satellites, sustaining a rate of 3 to 4 launches a year at a competitive price by 2021. Ariane 5 is hamstrung by the need to find 2 satellites ready to launch every 2 to 3 months and compatible with its lift performance,” notes Joseph Berenbach. “On the other hand, Ariane 6 will launch a single satellite at a time, so it will be much more flexible and responsive: customers will no longer have to wait to launch their spacecraft. 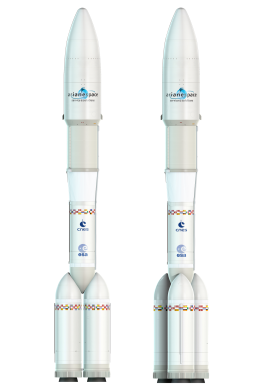 Two possible configurations for the 1st stage of the future Ariane 6, with 2 or 3 boosters. Credits: ESA/CNES/Arianespace. Since 2009 and the report commissioned by then Prime Minister François Fillon, European engineers and manufacturers have been hard at work on the new launcher. Over 100 concepts were studied before deciding on a 3-stage PPH configuration. The PPH configuration will comprise 2 solid-booster stages and a 3rd liquid hydrogen and oxygen stage, like the current Ariane 5,” explains Joseph Berenbach. The thinking behind this decision is basically that solid boosters can be series-produced economically while the upper cryogenic stage engine will significantly enhance the launcher’s performance. Ariane 6’s 1st stage will consist of 2 or 3 solid boosters so it can adapt to launch heavier or lighter satellites,” adds Joseph Berenbach. “This multi-solid concept developed with our industry partners Astrium, Herakles and Snecma is completely new. Ariane 6 is scheduled to make its first flight in 2021. Before then, engineers will be working to develop a particularly powerful reignitable final stage for Ariane 5 in 2018 and ultimately for the new Ariane 6 in 2021.